As a sovereign state, Indonesia necessarily to actively involved in every dynamic and effort to build a better world. Therefore, as a nation, Indonesia actively involved in forum between nations both regional and global through bilateral and multilateral forums. The goal is for the national interest based on the principles of free and active foreign policy and directed to build a new world with principle based of freedom, eternal freedom and social justice. Based on the awareness of the importance of aforementioned activities, therefore, the strategy and action plan formulated correspond to the Long-term National Development Plan (RPJP), Mid-term National Development Plan (RPJMN) and Action Plan of activities of the related Ministries and Government Agencies. Description of the vision supported by the competence authorization of the responsible biodiversity management for the welfare resources and sustainable national life. The preserved biodiversity carried out through improvement of science, technology, and the comprehensive and integrated utilization. In order to achieve the goal, it is necessary to improve the human resources competency to support research and data and information maintenance, and also sustainable utilization of modified biodiversity. A good maintenance of biodiversity can improve the comprehensive biodiversity development, both in aspect of science and technology, also in human resources and sustainable utilization. This, of course, can contribute to the competitiveness and maximum utilization of biodiversity for the nation’s welfare, today and for the future generation. 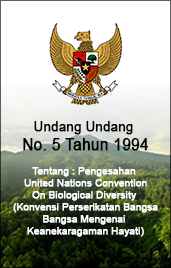 To improve the authorization of Indonesia biodiversity that belong to the nation of Indonesia. 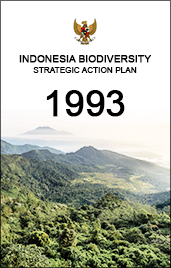 This mission carried out so the biodiversity that become national identity necessary authorized by Indonesia, sovereigned, belong and manage by Indonesia for the national and state welfare. 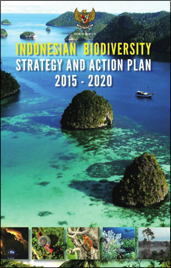 To make biodiversity as the welfare resources and sustainable life of the nation of Indonesia. This mission carried out to improve in real utilization of biodiverity and moreover, to contribute to economic growth and community welfare. This can be achived through ecosystem function improvement to ensure the improving on the essentials services (water, health, livelihood and tourism). The preservations and ecosystem restoration effort in the degradation areas and access implementation and profit sharing from the genetic resource. Responsible biodiversity management for sustainable life. This mission carried out to give balance undestanding between first mission and the second one, that although the biodiversity belong and authorized by Indonesian government, it is also part and belong and become the world identity, in the present and future life in the world. Therefore, the management of biodiversity must follow the principle of sustainability, be responsible and give access to the international community as part of world relation and to get the optimum utilization for world community walfare and its sustainability. 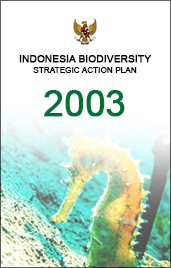 As biodiversity management improvement means, in order to conserve and utilize the element sustainbly and gaining the maximum benefits for citizen of Indonesia’s prosperity and welfare, therefore, policies has been formulated, strategic and action plan including national target of IBSAP 2015-2020 according to mandate of Law no.5 year of 1994 about ratification of Convention on Biological Diversity, Law of Cartagena Protocol Ratification and Law of Nagoya Protocol Ratification. Organizing the biodiversity research, biodiversity data and documentation management and right and ownership management (paten / HAKI) that put forward the interest of nation and state of Indonesia. Monitoring, evaluation and reporting (MEP) carried out to ensure the implementation of IBSAP correspond to the plan and able to achive the goal and target. Furthermore, MEP from the IBSAP implementation can become a resource for national reporting forming of Convention on Biological Diversity that being written every four years. National reporting is providing the information of Convention on Biological Diversity including IBSAP implementation that become an instruments to monitor the implimentation of CBD in the national and regional level. Government Regulation (PP) No.39 year of 2006 about Control and Evaluation of Development Implementation Plan. Letter of Agreement (SKB) Ministry of Finance and Ministry of National Development Planning / Head of National Development Planning Office No. Kep102/Mk.2/2002 and No. Kep.292/M.Ppn/09/2002 about Monitoring System and Implementation of Project Development Reporting. Regulation of Ministry of Finance No. 249/PMK.02/2011 about Measurement and Evaluation of Performance on Work Plan Implementation and Budget of Ministry / Institutions; and several other technical rules.